The Massachusetts Bay Colony required that each established township have a meeting house to serve both the municipal and religious activities of the town. The “Publik House” was a place for town meetings, elections, and municipal offices, as well as a place of worship on the Sabbath. As colonists began to cross the Nashua River and increase settlement in the western part of Groton, they found it difficult to travel the distance each Sunday to attend services. This problem provided a reason to separate from Groton. 1753 – The Massachusetts General Court granted the establishment of the District of Shirley, named after Governor William Shirley. 1754 – The first Meeting House, located on the north side of Green Lane, facing what is now Parker Road, was finished. 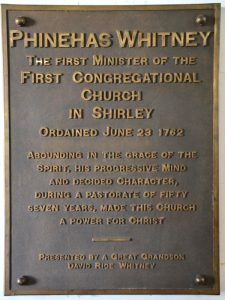 1762 – Phinehas Whitney of Weston, the first permanent minister, received his call to settle in Shirley. 1771 – With the increase in population of the newly formed town came the need for a larger meeting house. On May 21, Shirley citizens voted to construct a new meeting house 50 feet in length and 40 feet in width, and that £200 be assessed taxpayers towards its cost. A new location was decided upon and land adjoining the western boundary of the militia training field was purchased for the site of the new building. 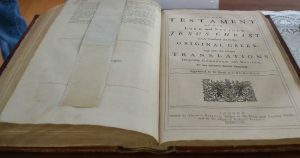 1772 – To commemorate the building of the new Meeting House, Madam Lydia Hancock, aunt to patriot John Hancock, and also aunt to Lydia Bowes, the wife of Minister Phinehas Whitney, presented an elegant folio Bible to the parish. This Bible has been used for all of the services throughout the history of the First Parish and still resides there. 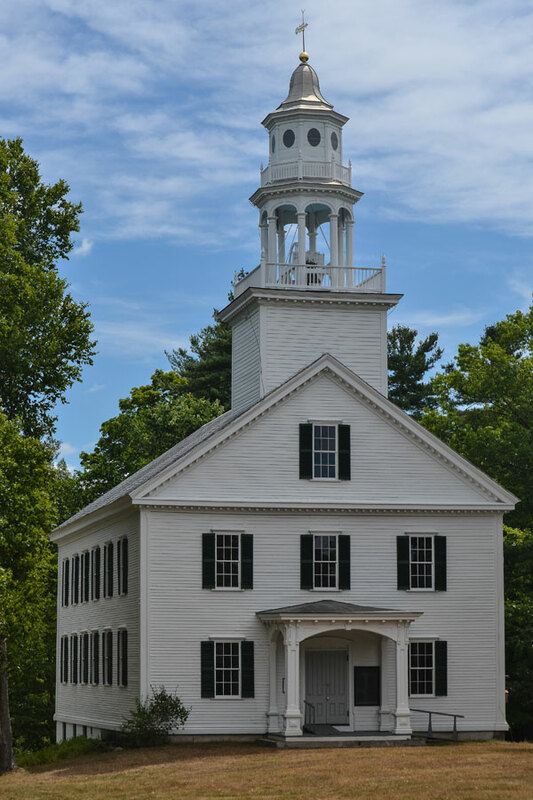 1773 – On November 25, the annual day of Thanksgiving, the first service was held in the new Meeting House. The cost of the completed structure was £168 10 shillings, and its original framework remains as the core of the today’s building. The original meeting house plan had entrance doors on three sides. Aisles led across its length and breadth in front of the raised pulpit centered on the north wall. The pulpit was illuminated by a compass head window with a large paneled sounding board suspended over it. The ground floor was occupied by family-owned box pews with benches in the balconies. 1776 – In his diary, James Parker records that on June 27, there “was town meeting in order to see whether the People would declare Independence to Great Britain”. Eighty of Shirley’s militia heard the call on April 19 and marched to Lexington and Boston for the cause. 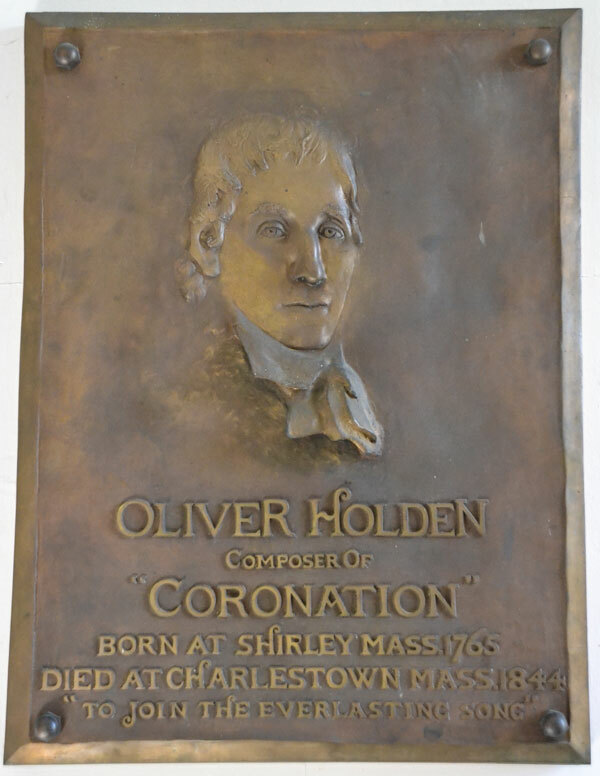 1787 – On April 24, the members voted to purchase a bass-viol to provide accompaniment to the hymns sung by the congregation. It was in use until 1847 when it was replaced by the organ. 1804 – The first enlargement of the Meeting House was voted by the town. Three “porches” were constructed at the entrances, with the east and west ends large enough to relocate stairs to the gallery and allow additional pews to be sold. The west entrance “porch” was carried up to a tower and belfry. 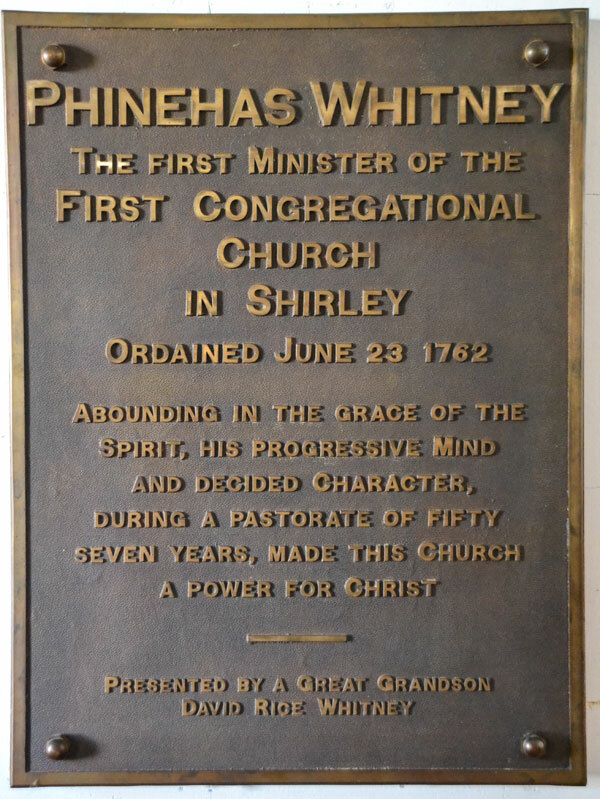 1815 – Minister Phinehas Whitney retired after 53 years of service. 1834 – The first heating system was installed with two large stoves with flue pipes arranged to provide warmth to the building. 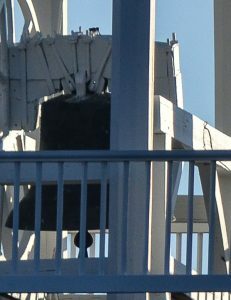 1 835 – Earlier bells in the tower were either too small to be heard in the distance or had suffered cracks. In May, Leonard Parker and Thomas Whitney presented a new bell that is rung on special occasions to this day. 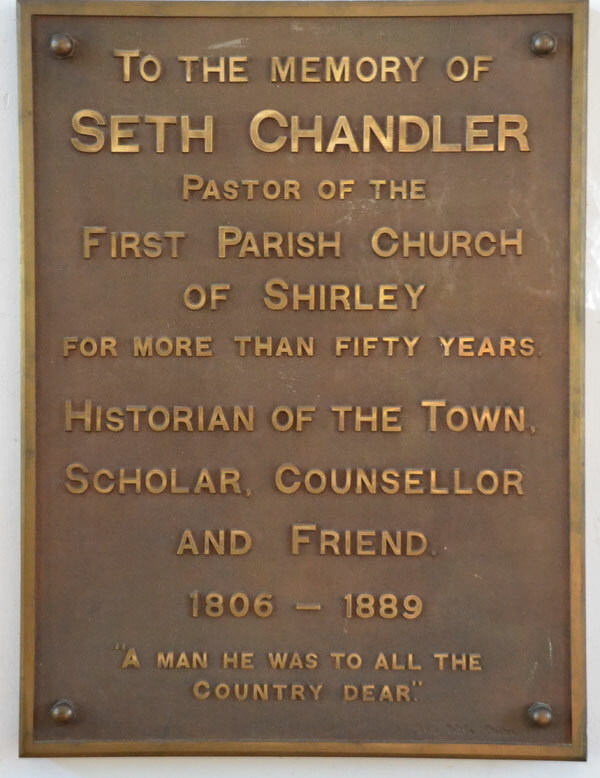 1836 – On December 14, Reverend Seth Chandler began his ministry, which lasted for 45 years. 1839 – A major alteration to the interior of the Meeting House was completed by local craftsman, Wilder Dodge, at a cost of $2,307. The old box pews and raised pulpit were replaced with the present arrangement of double aisles and slip pews. The west end was remodeled by extending the building the depth of the bell tower, creating a vestibule with two doorways in line with the double aisles. A new mahogany veneered pulpit was installed in the east end. The women of the parish established a lending library with 600 volumes for dues-paying members, along with an additional 1,000 books for the juvenile library. Both collections continue to be housed in the Meeting House. 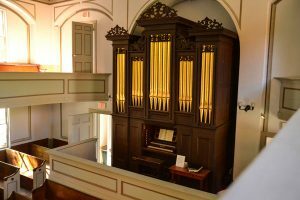 1847 – Madam Henrietta Whitney donated the sum of $1,300 for the installation of a pipe organ manufactured by George Stevens of East Cambridge. 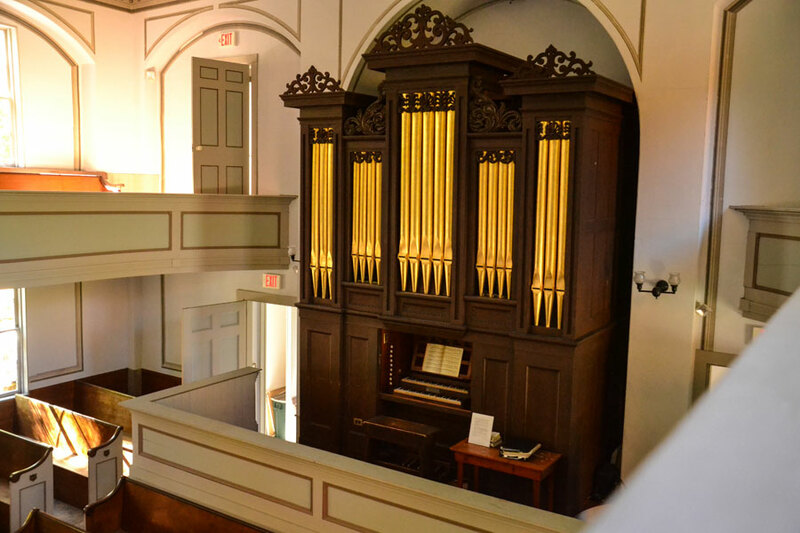 The organ, with 14 stops and 599 pipes, remains unaltered from its original construction and can still be hand-pumped. 1852 – The town voted in July 18, 1851 to move the Meeting House 100 yards east onto the training field in line with the Town Hall. Work began in the summer of 1852 and the first service at the new location was held in October. 1867 – Henry Going donated $6,000 towards remodeling the interior design to include arcaded openings over the balcony windows, an apse addition on the east end, Tromp L’oeil wall paper, and a new single entrance and portico. This is the interior we see today. 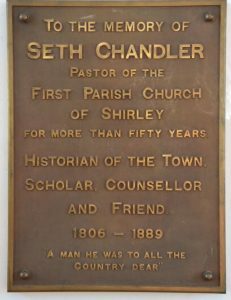 1898 – Bronze tablets memorializing the ministries of Phinehas Whitney and Seth Chandler were placed on the walls on either side of the apse. 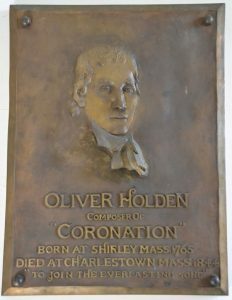 A bas-relief of Oliver Holden, a Shirley native and composer of the hymn “Coronation”, was placed in the front lobby. This bas-relief was sculpted by George Grey Barnard, who started the medieval sculpture collection now housed at the Cloisters in New York. 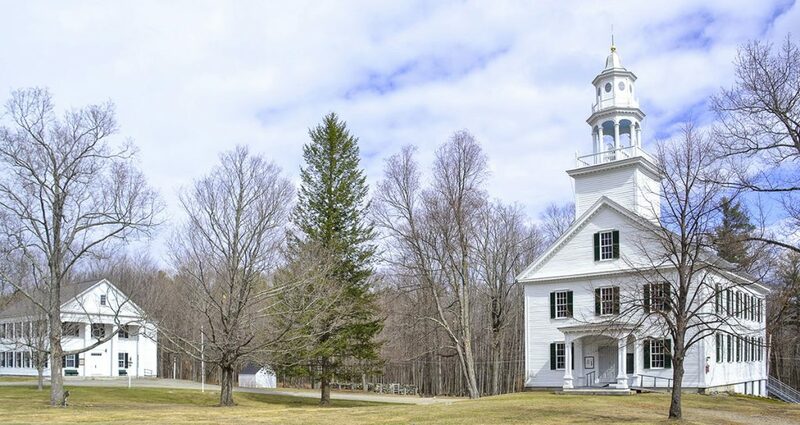 1944 – Upon the dissolution of Unitarian congregation at the First Parish, a group of Shirley residents concerned for the preservation of the Town’s oldest public building formed an informal society to maintain and preserve the Meeting House. 1975-1979 – Local resident Melvin Longley restored the interior of the Meeting House. He carefully removed the plain wallpaper panels, leaving the 1867 tromp l’oeil decorative paper, and repainted the missing areas to restore the walls and ceiling. He also re-painted the woodwork to complete the interior. He labored almost single handedly over four years to complete the project. 1995 – The First Parish Meeting House Preservation Society of Shirley, Inc., was incorporated as a 501c3 charitable organization, to preserve the Meeting House and continue its use as a venue for concerts and other community activities. 2015 – The three-year $124,000 capital campaign for the exterior restoration project was completed. A new exit door and fire escape were added, structural repairs were made, the bell tower cupola was restored with a new metal roof, the exterior was re-painted, and a gilded replacement weathervane was installed.